QUESTION: Hi Mike! I have a koi pond in my backyard with 4 big koi and lots of goldfish. We are in New York state and having some very cold weather. I have an air pump in my pond for the winter but the hole has become covered with ice this morning. What should I do? Should I break open the ice? I’m worried about my fish and I can’t see them. ANSWER: Hi and thanks for reaching out. You are not alone in trying to deal with the extreme weather conditions, we are experiencing the same conditions here in New Jersey. I have received several calls, messages, and emails from pond keepers who are having the exact same problem of how do I de-ice my koi pond. The first thing I recommend doing is to just check your air pump to make sure it is still functioning. Assuming that it is still working ok, then the good news I have for you is that there is not much that you have to do. My company has a pretty standard protocol when preparing our clients ponds for the winter months by installing a floating de-icer as well as aeration. We like to use both pieces of equipment for extra insurance in case of extreme weather like we are having now! The floating de-icer will allow for some passive de-icing for the pond and keep an area open in the ice to allow for gases to escape and oxygen to get in. The aerator is an active de-icer and a much more efficient way to de-gas the pond and introduce oxygen. 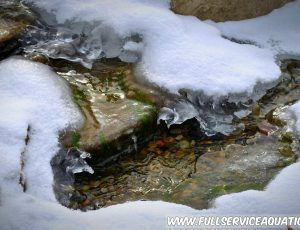 The bubbling action of the aerator adds some gentle circulation in the pond while keeping the surface of the water agitated and moving so ice cannot form very easily. This surface agitation does a great job of keeping ice open even to sub-freezing temperatures. However, in sustained sub-freezing and single digit temperatures the ice can still form, often times creating a dome of ice over the area where the air bubbles are breaking at the surface. Many pond keepers will become quite worried once that open area of water disappears from view, but as long as the aerator is still functioning you do not really have much to worry about, generally speaking. The area will visually look different when the open water has disappeared from view however just below that icy covering/mound your pond is still functioning the same. The aerator is still circulating the water and de-gassing the pond, its just that the gases (like ammonia) that are leaving the pond are taking a different route than escaping directly from where the hole would usually be and oxygen is taking a different route into your pond. The open hole in the ice is a comforting visual indicator, but the closing of that hole does not mean very much in reality apart from seeing a hole in the ice. The ice covering on koi ponds and water gardens are NOT air tight covers. When taking a close look at a “completely frozen” pond surface you will find many small openings around the perimeter of the pond. In fact the layer in between the liquid water and ice covering still “breathes” just fine. Many pond keepers want to break open the ice or melt holes, just to have it freeze again hours later (of course!). The task of breaking open ice is difficult and stressful for fish and pond keeper alike, and could even be dangerous! I’ve seen people doing some pretty crazy stuff trying to melt open a hole in their pond in freezing weather, only to have it freeze again. Sometimes people forget the reality that freezing temperatures creates frozen water, no matter if they spent time melting it, water will still behave that same way in freezing conditions no matter how much we want it to behave against its nature. So, my advice is that as long as your aerator is functioning just let it do its job regardless of the visual cues that we typically want to see like an open hole in the ice. Once temperatures get back to above 25F-30F you will see that hole open right up again! Please let me know if you need any more help or would like a referral to a pond professional in your area. 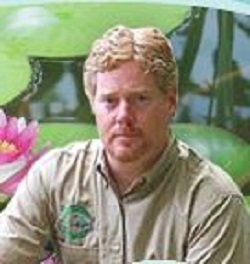 My website has tons of info as well so go to www.fullserviceaquatics.com for more help. Good luck and keep warm!! 3 Comments on How Do I De-Ice My Koi Pond?